Calling Security at Grantley Adams International Airport. Hello? Hello? I took this picture while waiting on my ride at arrivals area. 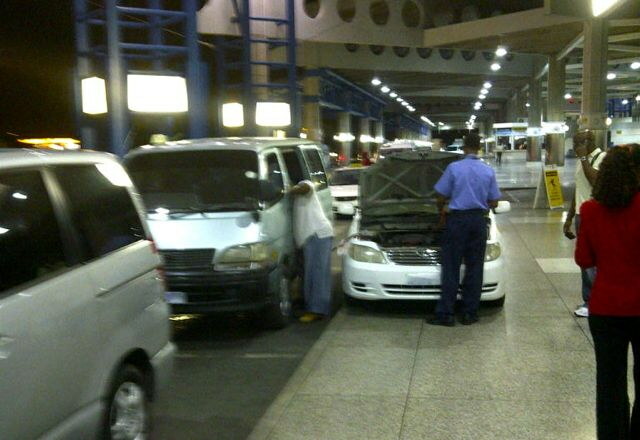 The taxi van is being jump started by the taxi car. This seems to be a regular thing. Just to be clear the car has jumped the curb completely and is up on the floor of the passenger waiting area. One can’t help but wonder in todays climate of security concerns at airports worldwide if this had happened at the curb at say JFK or Heathrow where someone had driven up onto the passenger waiting area and parked for 10 minutes – what would have been the outcome? At Grantley Adams airport security was nowhere to be seen. Only in Barbados! Good to be home. Click on the photo to hear some of the best Caribbean music and talk from One Caribbean Radio! Our heartfelt condolences to the family and friends of Roderick Reid, who was expected to return to his studies at Cave Hill yesterday. Roderick’s body was found on Saturday in the boot of a car in Kingston, Jamaica. That’s about all we know at this time. If anyone has a photo of Roderick, we would include it. Roddy was well liked and had many friends.